With special thanks to Eli Bishop. Perelandra (sometimes published as Voyage to Venus) begins with what could probably be called an elegant horror scene, with the author keenly describing his inner fears as he attempted to enter the house of his friend, Dr. Ransom. The scene reads as if it was taken from the writings of H. P. Lovecraft, especially when we consider that the author’s seemingly insane, nightmarish fears turn out to be based on reality. But it is not a horror novel. It is not a science fiction novel, either, despite what you might read on the cover. 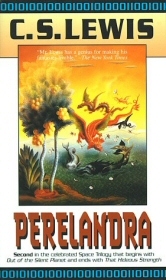 Much more than the other two volumes in the trilogy, Perelandra is best described as Religious Fiction. The book includes a brilliant, challenging discussion on the question of good and evil set in on a most original background, presented as a direct contest between the Beast and our hero, Dr. Ransom. While the first volume of the trilogy took part on Malacandra, or Mars, the second volume takes place on Venus, called Perelandra in the old tongue of the solar system. Ransom is brought there by the powers he met on Mars, for a mission that was not explained to him but remains a mystery only for a short while. Once on Venus, Ransom finds himself in a re-telling of the story of the Garden of Eden. On Venus, man had not fallen yet, but here again the Beast (this time, not in the form of a snake but rather in the form of a physicist) tries to tempt Eve (the Green Lady) into breaking the only taboo set by God. The taboo here is not avoiding a certain fruit but rather never staying after sundown on the only solid island on the planet. Ransom slowly realizes the very special position he is in. He also realizes that he is the only part of the story that has no equivalent in the original Biblical story: there was no one else in the Garden to argue against the snake when it tempted Eve. And so, as the Beast tries to tempt the Green Lady to sin, Ransom does his best to tell her better. The discussions in which the three characters engage form the lion’s share of the book. They are a rich philosophical debate about the question of faith and obedience. Why, asks the Beast, should the word of the Lord be followed even if there is nothing immoral about breaking his word? Why is there anything wrong with a deed that is obviously not evil, and that will apparently only help the doer, improve his position, and change his life for the better? Understanding what is meant by the fall of man -- how we are broken, and how we each repeat the same tragedy in our individual lives -- is central to Lewis’s theology. Perelandra is partly an attempt to illustrate how “obedience” means more than obeying an arbitrary rule; in this story, breaking the rule and breaking your connection with truth and wholeness are part of the same process. The physicist which presents the snake in this story is Dr. Weston, familiar to the readers of Out of the Silent Planet. At first, it seems like it really is Weston; he finally understands that religious people were right, in a way -- he had built himself some sort of a new scientific religion. Through this character, Lewis seems to be warning us of trying to have scientific theories completely replace belief; he seems to be warning us of the pseudo-religious approaches to science, or pseudo-scientific approaches to religion, that became popular in various theories -- especially during the 19th century. In fact, most of the arguments used by Weston in favor of this view were used by actual scientists and philosophers of the time. But quickly enough, it becomes obvious that it is only Weston’s body that is present; Weston is clearly no longer human, being totally possessed by the Evil One himself. And the moment it had done so, Ransom felt certain that the sounds it had made were perfect Aramic of the first century. The Un-man was not quoting; it was remembering. These were the very words spoken from the Cross, treasured through all those years in the burning memory of the outcast creature which had heard them, and now brought forward inhideous parody; the horror made him momentarily sick. While the discussion was profound, I found myself very surprised in the seemingly non-Christian answer which Ransom found to the problem. From a Christian writer like C. S. Lewis, I would not had expected such a solution. I later realized that, considering the scene, there was really nothing wrong with it; indeed, as Lewis claims, it was the only solution possible. In a manner that is fitting more to a religious text than to a discussion about religion, Perelandra ends with what can only be considered a modern appendix to the Book of Psalms. A Wrinkle in Time is an outstanding, highly-recommended, juvenile science-fiction book by Madeleine L'Engle. It was published in 1962, years after The Cosmic Trilogy; I do not know if there is anything to it, but I found many amusing parallels between this book and Lewis’s trilogy. The first similarity is that in both books, people leave Earth to other planets only to realize that Earth is different. It is different because elsewhere in the universe, Good is the natural, understandable thing, while Earth itself is “shadowed” as L'Engle called it, a “silent planet” as Lewis did -- here on Earth, there are evil people, and goodness is not obvious at all. In Perelandra, I found another similarity -- here, planets (Venus and Mars) take the form of people, and they are viewed and talked to by our hero Dr. Ransom. In A Wrinkle in Time, some of the most intriguing and amusing characters turn out to be stars that took the shape of people in order to converse with humans. In Many Waters, one of the many sequels to A Wrinkle in Time, the twins Sandy and Dennys visit the Biblical story of Noah and the Ark -- while in Perelandra, Ransom visits a re-telling of another Biblical story. It should be noted that much like Lewis, L'Engle is a religious person, though her books form less of a deep religious discussion -- understandable, considering her target audience. Mark Wallace Maguire has composed and recorded in green seas, under copper skies, a digital album inspired by Perelandra, with tracks such as Life Off, The Green Lady, and Ransom’s Rebirth. Maguire’s site has the interesting story behind the music.